For the Romanian village, see Ceru-Băcăinți. From above and from left side to right: North-east of the city with the University Hospital Erasmo Meoz, Cúcuta's esplanade, Cultural Center Quinta Teresa, Monument to Simón Bolívar in the homonymous park, Monument to Battle of Cúcuta and Public Library Julio Perez Ferrero. Cúcuta in Department of Norte de Santander. Urban in red, municipality in dark gray. Cúcuta (Spanish: [ˈkukuta] ( listen)), officially San José de Cúcuta, is a Colombian city, capital of Norte de Santander department. It is located in the northeast of the country, in the eastern branch of the Colombian Andes, on the border with Venezuela. Cúcuta has a population of approximately 750,000 people according to the 2005-2020 census, making it the 6th largest city in the country. Due to its proximity with Venezuela, Cúcuta is an important commercial center, hosting many billion dollar companies. The international border in Cúcuta is said to be the most dynamic of South America. The city has a length of 12 kilometres (7.5 miles) from north to south and 11 kilometres (6.8 miles) from east to west. It is divided into 10 communes and it is the political, economic, administrative, industrial, cultural and tourism hub of the Norte de Santander department. Cúcuta has experienced a great urban development, as a result other cities have been formed around it, like Los Patios in the east, and Villa del Rosario in the south. They are part of the Metropolitan Area of Cúcuta which has a population of about 850,000 people. It is connected by roads across the country to major cities like Bogotá, Bucaramanga, Ocaña, Valledupar, Pamplona, Tunja and Cartagena de Indias and because of its location, to many cities of Venezuela. Its airport, Camilo Daza International Airport, offers flights to several Colombian cities. The city was the place of some of the most important events in Colombian history, like the redaction of the first constitution by the Congress of Cúcuta which led to the foundation of the Republic of Colombia, also known as Gran Colombia, and the Battle of Cúcuta, where troops led by Simón Bolívar defeated the Spanish Royal Rorce, thereby liberating the city from Spanish rule and allowing Bolívar troops to continue their campaign toward Venezuela. According to figures from the National Administrative Department of Statistics of Colombia (Dane), 40 percent of the population of Cúcuta live in poverty in 2019. The city of Cúcuta was called San José de Guasimales from 1733 to 1793, the year in which the name changed to San José de Cúcuta—"San José" (Saint Joseph) is for the Virgin Mary's husband, and "Cúcuta" ironically means "The House of Goblins" in the language of the Barí indigenous group. 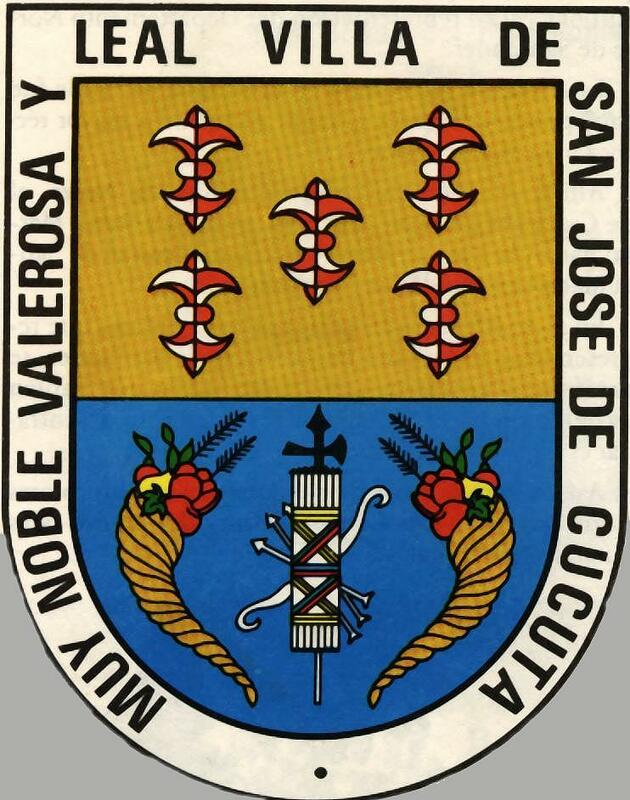 In the city's seal, a legend states, Muy Noble, Valerosa y Leal Villa de San José de Cúcuta ("Very Noble, Valiant and Loyal Town of San José of Cúcuta"). The city has the nicknames "City Without Borders", "Gem of the North," and "City Forest.". Cúcuta was originally a pre-hispanic settlement. It was entrusted to Sebastian Lorenzo by Pedro de Ursua as an encomienda in 1550. Juana Rangel de Cuellar founded Cúcuta on June 17, 1733, and donated a further 782 hectares (1,930 acres). The village, centred on a church, grew considerably due to its strategic commercial location, and eventually became a city. Several important events that forged Colombia as an independent republic took place in the city: one of these events was the Congress of 1821, where the Constitution of Cúcuta was written and approved. This constitution created Greater Colombia, a country embracing the present-day territories of Colombia, Venezuela, Ecuador, and Panama. The city preserves places where these historical events took place: the Historical Church of Cúcuta, the House of Santander, and the Park of Greater Colombia. As the site of the Battle of Cúcuta (February 28, 1813), the city was the beginning of the Admirable Campaign led by Simón Bolívar. This campaign resulted in the independence of Venezuela. The first European in the North Santander territories was the German conquistador Ambrosio Alfinger, who came from Santa Ana de Coro (Venezuela) in 1530 with a troop of adventurers, and invaded the unexplored eastern region of the newly created Governorate of Santa Marta. Alfínger, in search of El Dorado, arrived in an area of indigenous settlements called Tamalameque along the Magdalena River, fighting and defeating several tribes. Alfinger was eventually killed in the outskirts of present-day Chinácota in a battle with Chimila and Chitarero. With Alfínger dead, Fedro St. Martin took command of the troops and returned to Coro, passing through the territory of Cúcuta. In 1541, Hernán Pérez de Quesada reached the territory of Chinácota, but had to turn back the same year due to resistance by the indigenous people. Shortly thereafter, Alfonso Perez de Tolosa left El Tocuyo (Venezuela) and went to Salazar de Las Palmas, through Cúcuta, but also had to turn back after losing many soldiers in clashes with the natives. In 1549 Spanish troops, commanded by Pedro de Ursúa and Ortún Velasco, invaded North Santander and reached the valley of Pamplona. In tribute to the Spanish city of Pamplona, the Spaniards founded the city of Pamplona. The new town soon attracted numerous people because of its agreeable climate, and gold mines that were discovered in the region. Further expeditions left this town and completed the conquest of the current territory of North Santander. An expedition commanded by Diego de Montes founded the town of Salazar, but it was soon destroyed by the cacique Cínera. In 1583, the town was rebuilt by Alonso Esteban Rangel (great-grandfather of the founder of Cúcuta), on a site more appropriate for its defense in the event of new attacks by the natives. The second expedition, commanded by Captain Francisco Fernández de Contreras, reached the lands of the Hacaritamas indigenous group and, on July 26, 1572, founded the city of Ocaña, calling it "Santa Ana de Hacarí". Some of his colleagues named it New Madrid, and others Santa Ana of Ocaña. The next year, Antonio Orozco, a subaltern of Fernández, founded the town of Teorama, while the Augustinian Friars founded a convent in what is today the city of Chinácota. "A journey through the city centre where the Cathedral of St. Joseph, the Palace of Government and the Monument to the column of Bolivar are located is returning to the historical roots of our ancestors.". In the early 17th century a great part of the valley of Cúcuta belonged to Captain Christopher de Araque Ponce de Leon. The land passed through inheritance to his son Fernando Araque Ponce de Leon, who was owner of the entire territory from the Valley of Cúcuta to the village of San Jose, the jurisdiction of the city of San Faustino. These fields had been donated to the older Araque by the Governor of the Province of New Mérida on September 9, 1630. The resistance of the Motilones indigenous group towards the whites who were taking over and controlling the valley with economic ambitions was the key factor in the request for the establishment of a Catholic parish with the name "San José." Juana Rangel de Cuéllar donated 782 hectares (1,930 acres) on June 17, 1733 for the construction of a church and land for Spanish families. Today this area is the neighbourhood of San Luis. The Battle of Cúcuta was one of the most important events of the Spanish American wars of independence, due to its role in the independence of Colombia and Venezuela. This battle was the beginning of the Admirable Campaign of Simón Bolívar. On February 28, 1813, Bolivar captured the city after a battle that lasted from 9:00 a.m. until early afternoon. About 400 men led by Bolivar fought 800 troops led by the Spanish general Ramon Correa. Bolivar's forces reported losses of two killed and 14 injured, whilst the royalists are said to have suffered 20 killed and 40 injured. The victory freed the city of Cúcuta and led to the Admirable Campaign. Colonel Simón Bolívar then launched a major offensive against the Spanish forces who were on the east bank of the Magdalena River and quickly achieved resounding victories. These led him to undertake a journey to liberate the Valley of Cúcuta held by the command of royalist Colonel Ramon Correa. On August 30, 1821 the Congress of Cúcuta took place at the town of Villa del Rosario (today part of Cúcuta) in the church known today as the "Historic Temple of Cúcuta". The congress was established by Antonio Nariño and its participants included Francisco de Paula Santander, Simón Bolívar, and other leaders of Spanish America's struggle for independence from Spain. The main objective of this congress was to unify the territories of New Granada (Colombia and Panama) and Venezuela and thus create a huge state to be known as the Republic of Colombia (Gran Colombia). 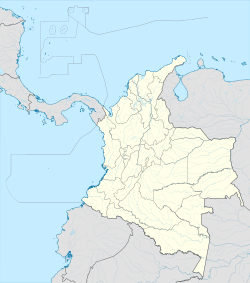 Ecuador subsequently joined Gran Colombia. At 11 am on October 3, 1821, Simón Bolívar entered the meeting room in the sacristy of the church. He took a seat next to the president of Congress and was sworn in as president of the fledgling Republic of Colombia. On 18 May 1875, Cúcuta was largely destroyed by the earthquake of Cúcuta, also known as the "Earthquake of the Andes". The earthquake occurred at 11:15 a.m.; it destroyed Villa del Rosario, San Antonio del Tachira and Capacho, seriously damaged the Venezuelan settlements of San Cristóbal, La Mulata, Rubio, Michelena, La Grita and Colón (among others), and was felt in Bogotá and Caracas. In the 19th century, the construction of a railroad set off an Industrial Revolution in the city. The railroad had four branches: North, East, South and West. The North branch was constructed from 1878 to 1888, and connected Cúcuta with Puerto Santander and Venezuela. Construction of the Eastern and Southern branches began in 1878; the South branch linked with Pamplona, Colombia, and ended in El Diamante. The West branch was not built owing to economic problems. The railroad company fell into bankruptcy and was closed in 1960. Many of the city's historic buildings lie within the Park of Greater Colombia, including the House of Santander, the historic church, and the historic tamarind. All these are well preserved. The city is in the eastern part of the Department of North Santander, in the Cordillera Oriental, close to the border with Venezuela. The city's area is 110 square kilometres (42 square miles) and its elevation is 320 metres (1,050 feet) above sea level. Rivers in Cúcuta and Norte de Santander include the Pamplonita River, Guaramito River, San Miguel River and Zulia River. The Pamplonita River crosses the Norte de Santander Department. Cúcuta has a tropical savanna climate. The mean temperature is 27.6 °C; high temperatures are around 38 °C. There is a sharp contrast between the wet season and the dry season. The driest months are December, January, February and March; the wettest are April, May, September, October and November. June and July usually have significant precipitation, whereas August is sunny and windy. The annual precipitation is around 1,041 mm (40.98 in). Cúcuta's streets are organized in a grid layout adopted from Spain in colonial times. Calles (streets) run from east to west, perpendicular to the hills, and numbering increases to the north and to the south from Calle 1. Avenidas (avenues) run from south to north, parallel to the hills, and numbering increases both east to west, and west to east from a central avenida numbered 0 (Avenida Cero, one of the city's most important avenues). From west to east, avenues are numbered with an E added to their number, to denote East (este) . More than 300 neighborhoods form the urban network. Poorer neighborhoods are in the north, north-west and south-west, many of them squatter areas. The middle class lives mostly in the central and eastern areas. The red and black North Santander Department flag was exhibited for the first time in 1928, when the first National Olympics were held in Cali. However, the flag of Cúcuta was not legalized until Mayor Carlos A. Rangel issued Decree 106 on May 3, 1988. The shield of Cúcuta was adopted on February 3, 1958, by Decree 032, after a request by the History Academy of North Santander. The shield is a classic shape, and carries the title conferred on the city by Royal Decree of the Emperor Carlos IV: Very noble, valiant and loyal town of San José of Cúcuta. The upper part depicts the arms of the city's founder Juana Rangel of Cuéllar, who donated lands for the foundation of the city on June 17, 1733. They are five silver and red fleur-de-lis in the shape of reels, on a golden background. The lower part of the shield displays the arms that the National Congress adopted for Colombia by the Law of October 6, 1821, at its meeting in the Villa del Rosario. In the center are a quiver of spears, marked with X's, and a set of bow and arrows, tied with tricolor tape. The spears represent attributes of the Roman consuls; the X is a symbol of the right of life or death; the bow and arrows are symbols of the Hispanic Indu race. The Anthem of Cúcuta was legalized by means of Decree 039 of February 8, 1984, by Mayor Luis Vicente Mountain Forest. The lyrics were written by Father Manuel Grillo Martínez, and the music by the master Pablo Tarazona Prada. It was chosen as the Anthem of Cúcuta by a unanimous vote in a contest held in the Theater Zulima. The metropolitan area, which includes the municipalities of Villa del Rosario, Los Patios, El Zulia, San Cayetano and Puerto Santander, has a combined population of more than 830,000 people. It is the largest metropolitan area in eastern Colombia and seventh in Colombia, behind Barranquilla, Bucaramanga and Cartagena. James Rodríguez, footballer who plays for German club Bayern Munich. Francisco de Paula Santander, the first president of Colombia, known as "the man of the laws". Virgilio Barco, a former president of Colombia. Elias M. Soto, a classical musician. Marino Vargas Villalta, civic leader and businessman. During the fifties and sixties, he was also the president of the popular and successful local football team, the Cúcuta Deportivo. Alberto Villamizar, a former congressman and ambassador to Indonesia, the Netherlands and Cuba, Colombia's first "kidnappings czar" and leading political figure of the Nuevo liberalismo (New Liberalism) movement of Luis Carlos Galan. The current mayor of Cúcuta is Donamaris Ramírez-Paris Lobo, who was elected for the 2011-2015 period. He represented the Partido Verde and achieved approximately 43% of the votation or 98,588 votes. The city is governed by the three branches of power: the executive power, represented by the Mayor and its departments; the legislative power, represented by the City Council; and the judicial power, which is formed by the tribunals and many other organisms of control. The Mayor is elected for a 4-year period and is in charge of electing each head of the administration departments. The city council is formed by 19 representatives elected by popular vote for four years. They approve or reject each decree issued by the Mayor and make or correct laws regarding the city. As capital of Norte de Santander Department, Cúcuta houses the Department Hall and the City Hall of the Metropolitan Area of Cúcuta, along with the Francisco de Paula Santander Justice Palace. The city is divided into 10 localities (comunas). The Metropolitan Area of Cúcuta is formed by Cúcuta (as the main city), Villa del Rosario, Los Patios, San Cayetano, El Zulia and Puerto Santander. Politics in Cúcuta are not defined by a single political movement. Past rivals included the Colombian Liberal Party and the Colombian Conservative Party. Today the political landscape is shared by many political parties, none commanding majority support. Housing construction in 2010. The entire city is experiencing great development. The city is notable for bilateral trade and manufacturing. Its location on the border between Colombia and Venezuela has made possible strong links with the Venezuelan city of San Cristóbal, Táchira. Its Free Zone  is the most active of all those in the country and one of the most active in all Latin America, largely due to Venezuela being Colombia's second largest trade partner. The most developed industries are dairy, construction, textiles, shoes and leather. The city is a producer of cement of the first order and its clay and stoneware industry has the best reputation nationally for its high quality. The mining of coal also plays an important role in the local economy. The University Francisco de Paula Santander in Cucuta, the National University of Colombia in Bogotá, and the Pedagogical and Technological University of Colombia in Tunja are the only ones in the country that provide for the career of Mining Engineering. The peso is the official and sole legal tender currency in the city. Owing to its proximity to Venezuela, the bolívar was accepted by the vast majority of commercial establishments until the rapid devaluation of the Venezuelan currency began after the 2013 recession. Colombia signed a Free Trade Agreement with the United States against opposition by Venezuela. Despite this opposition, industries from Venezuela are constructing their infrastructure in Cúcuta to export their products to the United States, registering their products as if they were Colombian, a strategy that allow them to export without paying certain tariffs. For that reason, Cúcuta is expected to become an industrial city. Colombian law provides tax exemptions for Venezuelan imports through the Zona Franca, which, coupled with the motorway links between Cúcuta and Maracaibo, increases the possibility of exports from Maracaibo into Colombia. The city's telecommunications services include payphones, WiMAX wireless networks, and mobile phone networks (GSM, CDMA and TDMA). Telecom Colombia offers the services of local, national and international telephone and broadband ADSL Internet. There are three mobile telephone operators: Comcel, Movistar and Tigo. For travel outside the city, there is a bus station called "Terminal de Transportes" (to be replaced by a new one), the Camilo Daza International Airport (Colombia) and the San Antonio Airport (Venezuela). Eighty years ago the city had the "Railroad of Cúcuta", which connected with Venezuela. The main forms of public transportation are the bus (or collective) and taxicabs. In addition, National Planning has a project to build a mass transit system, under the name "Metrobus" (Cucuta). The highway to Bucaramanga (renovated in January 2007) connects Cúcuta with Bogotá, Medellín and Cali. The highway to Ocaña connects the city with Barranquilla, Cartagena and Santa Marta, and the highway to San Cristóbal connects it with Caracas. San Rafael Bridge – official name is "Benito Hernández Bustos". Francisco de Paula Andrade Troconis Bridge – the prolongation of Av. 0, connecting the city with the municipality of Los Patios. Elías M. Soto Bridge – rebuilt and extended to 6 rails. San Luís Bridge – imported from England. Rafael García Herreros Bridge – part of the East Anillo Vial. El Hospital Universitario Erasmo Meoz, main medical center of the city. Law 100 of 1993 is the law governing Health in Colombia, which is regulated by the Ministry of Social Protection. In Cucuta and North Santander, health is administered by the Municipal Institute of Health (IMSALUD) and the local Department of Health, respectively. Entities such as the Colombian Red Cross, Colombian Civil Defense (for emergencies, calamities and natural disasters) and the Colombian Family Welfare Institute (ICBF), are part of the social protection system. The city has the following public health institutions (or State Social Enterprises, ESE): ESE Erasmus University Hospital Meoz, the ESE Francisco de Paula Santander (Clinical Social Security), the ESE CardioNeuroPulmonar Rehabilitation Center, the ESE Hospital of Los Patios, and ESE Hospital of Villa del Rosario. Private health centers include: San Jose Clinic, the North Clinic, Clinica Santa Ana, Lions Clinic, the Samaritan Clinic, and Profamilia (sexual and reproductive health). The aforementioned entities are part of the network of institutions providing services to health attached to the Ministry of Health and the Ministry of Municipal Health Department. The Erasmus Hospital Meoz holds fourth-level scale and specializes in performing highly complex surgeries, such as transplants and reimplantations. Additionally, it offers healthcare puentos distributed in the different districts of the city, which deal with varying degrees of complexity. The city has a large number of health promoting entities (SPE's), such as Colsanitas, SaludCoop, Cafesalud, etc. Basic education and high school education are in Colombian "Calendar A" for schools (from February to November). The sport that gather people the most is football, although basketball, volleyball, and Inline speed skating are also popular. The Cúcuta Deportivo -recently relegated to the First Division- is the main professional team of the city, and play their local matches at the General Santander stadium. The team won their first Championship in the 2006 season and had a well remmebered participation in the 2007 Copa Libertadores, when they reached the semifinal and lose to the multichampion Boca Juniors; since that year, only one other Colombian team has reached the semifinal of the prestigious competition (Atletico Nacional from Medellin in 2016). Other professional teams located in the city are the Norte de Santander(Basquetaball team), and futsal team Cucuta Niza; Both squads play local at the Coliseo Toto Hernández. The city hosted the XIX National Games of Colombia in 2012, which helped to modernize many of the sport venues like the Coliseo Toto Hernández. The Colombian Football Federation announced that Cúcuta will be one of the venue cities to host the 2016 FIFA Futsal World Cup, an event that is celebrated every four years. The city has recently undergone development at an historically unprecedented rate. This has included construction of six overpasses, a convention center, a new bus terminal, a new Integrated Massive Transportation System called "Metrobus", modernization of state owned schools, renewal of downtown, and doubling the capacity of the General Santander Stadium. The monument of Camilo Daza, at the Camilo Daza International Airport. Santander Park (in Spanish, Parque Santander), the main park of the city located in front of the city hall. Colón Park (in Spanish, Parque Colón), constructed in honor of Cristopher Columbus (in Spanish, Cristobal Colón). Simón Bolivar Park (in Spanish, Parque Simón Bolivar), constructed in honor of Simón Bolivar and donated by the Consulate of Venezuela in Cúcuta. Cúcuta has more green zones than many cities in Colombia. Some consider the city an urban lung, due to its greenery and lack of pollution. Cucuteños, and the legion of foreigners who reconstructed the city after the 1875 earthquake, led by engineer Francisco de Paula Andrade Troconis, led to the development of greenery in the city. The first planted trees were clemones. Soon they were replaced by acacias, peracos and almond trees that adorned the parks and roadsides. An example of this city design is the Avenue of the Lights (based on oití, ficus and cují), that forms a natural tunnel admired in the rest of the country and by tourists. Palm trees are common in places such as Santander Park, Great Colombian Park, the Bank of the Republic and the Department Hall of Norte de Santander. ^ "Cúcuta, The Basketball Capital of Colombia" (in Spanish). Retrieved 2017-06-14. ^ "Cities and towns foundations". Luis Ángel Arango Library. Retrieved 2008-01-07. ^ "Proyeccion de poblacion 2005-2020". DANE. Retrieved 2015-10-24. ^ "Characterizing the Colombo-Venezuelan border". Andean Community of Nations. Archived from the original on 2007-12-16. Retrieved 2008-01-07. ^ "Cúcuta". Enciclopedia Britannica. Retrieved 2008-01-07. ^ "The city - Geographical data". Chamber of Commerce of Cúcuta. Archived from the original on 2008-11-21. Retrieved 2008-01-07. ^ "Seal of Cúcuta". Rincón del Vago. Archived from the original on 2007-11-29. Retrieved 2008-01-07. ^ "San José de Cúcuta". Norte de Santander. Archived from the original on 2007-07-23. ^ a b "Admirable Campaign". Polar Foundation. Archived from the original on 2008-02-21. Retrieved 2008-02-07. ^ "Admirable Campaign". Simón-Bolívar.org. Archived from the original on 2007-12-17. Retrieved 2008-02-07. ^ "Campaña Admirable" (in Spanish). Archived from the original on 2006-09-24. Retrieved 2006-02-11. ^ "Ferrocarril de Cúcuta" (in Spanish). Biblioteca Luis Ángel Arango. Archived from the original on 2017-06-08. Retrieved 2007-02-11. ^ "Centro Histórico Villa del Rosario" (in Spanish). Ministerio de Cultura de Colombia. Archived from the original on 2006-11-15. ^ Ministerio del Medio Ambiente. "Colombia; Rio de Cucuta" (in Spanish). Archived from the original on 2003-05-11. Retrieved 2006-10-15. ^ "Promedios Climatológicos 1981–2010" (in Spanish). Instituto de Hidrologia Meteorologia y Estudios Ambientales. Archived from the original on 15 August 2016. Retrieved 15 August 2016. ^ "Promedios Climatológicos 1971–2000" (in Spanish). Instituto de Hidrologia Meteorologia y Estudios Ambientales. Archived from the original on 15 August 2016. Retrieved 15 August 2016. ^ "Tiempo y Clima" (in Spanish). Instituto de Hidrologia Meteorologia y Estudios Ambientales. Archived from the original on 15 August 2016. Retrieved 15 August 2016. ^ a b c "Símbolos de Cúcuta". CúcutaNuestra.com. Archived from the original on 2007-12-14. Retrieved 2008-01-07. ^ "Donamaris Ramírez, nuevo alcalde de Cúcuta". Vanguardia.com - Galvis Ramírez y Cía. S.A. Retrieved 2011-10-30. ^ Comunidad Andina de Naciones: Caracterización de la frontera Colombo-Venezolana Archived December 16, 2007, at the Wayback Machine. Documentos informativos. Enlace revisado el 3 de junio de 2008. ^ COLFTA. "Cúcuta quiere sacarle jugo al TLC" (in Spanish). Archived from the original on 2006-10-09. Retrieved 2006-10-15. ^ Peña, Javier (2006-10-27). "Masificarán Internet Inalámbrico en Cúcuta" (in Spanish). CucutaNuestra.com. Retrieved 2007-02-19. ^ Peña, Javier (2006-10-31). "Avanza Plan 2500" (in Spanish). CucutaNuestra.com. Retrieved 2007-02-19. ^ "Cucuta si sera sede de los Juegos Nacionales". Somoslarevista. 29 Oct 2010. ^ "Copa Mundial de Futsal de la FIFA se jugará en Colombia en 2016". fcf.com.co/. 28 May 2013. Archived from the original on 2013-12-03. ^ "Comite Empresarial: TLC" (in Spanish). Archived from the original on 2006-10-09. Retrieved 2006-10-15. Wikivoyage has a travel guide for Cúcuta. Wikimedia Commons has media related to Cúcuta. Wikisource has the text of the 1905 New International Encyclopedia article San José de Cúcuta. Look up Cúcuta in Wiktionary, the free dictionary.